Cervical spondylosis is usual, age-related condition that affects the joints and discs in your cervical spine in your neck. It is known as cervical osteoarthritis or neck arthritis. Spondylosis is because of the wear and tear of cartilage and bones. While it is result of age, it can be caused by other factors also. This condition is present in more than 90 percent of people aged 60 and older. Some people never experience symptoms. But some can cause chronic, severe pain and stiffness. However, people who have it are able to conduct normal daily activities. To make the spine stronger body trying to grow extra bone which results in overweight of bone. However, the extra bone can press on delicate areas of the spine, such as the spinal cord and nerves, resulting in swelling and pain. Spinal bones have discs between them, which are thick, pad like cushions that capable to absorb the shock of lifting, twisting, and other activities. The gel-like material inside these discs can dry out over time and age. This causes your bones (spinal vertebrae) to rub together more, which can be painful and inflamed. Spinal discs can have cracks, which allows leakage of the internal cushioning material. This material can press on the spinal cord and nerves, resulting in symptoms such as arm numbness as well as swelling and pain that radiates down an arm. If you have had an injury to your neck area (during a fall or accident, for example), this can accelerate the aging process. The tough cords that connect spinal bones to each other can become stiffer over time, which affects neck movement and makes the neck feel stiff. Some jobs or hobbies involve repetitive movements or heavy lifting (such as construction work). This can put extra burden on the spine, resulting in early wear and tear. 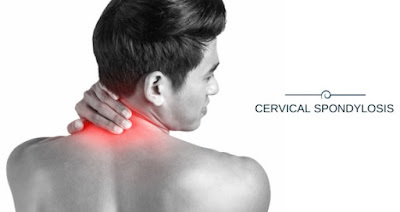 Most people with cervical spondylosis do not have substantial symptoms. If symptoms do occur, they can be from mild to severe and may develop gradually or occur suddenly. Another most common symptom is muscle weakness and stiffness. Muscle weakness makes it hard to lift the arms or grasp things firmly. · Headaches that mostly occur in the back of the head or particular part of head. · Tingling or numbness which mainly affects the shoulders and arms, although it may also occur in the legs. · Slowly turn head to the right until it hurts, hold it for 30 sec., and return it to the center position. Do same to the left side. · Drop your chin down slowly towards your chest, hold it for 30 sec., and relax. Bring your head back up to normal position. · Tilt your head straight over towards your left ear, hold it for 30 sec., and return it back to the center position. Do the same on the right side too. · Tilt your head backwards so you can see the ceiling, hold it for 30 sec., and then bring your head back down to normal position. · Lie down on your back. · Stretch your legs straight. · Place your hands beside, 5 to 6 inches away from the trunk. · While breathe in raise the right leg about 3 to 4 inches from the floor. Proceeds that leg to the right side, and then bring it down in a straight line position. · While breathe in, bend the leg at the knee position, bring bend legs close to the chest and touch the heel to the buts. · While exhaling, fastening the fingers together at the knee, and touch knee with nose. · While inhaling, lower back the neck to the floor. · While exhaling, release the fingers grip and stretch the right leg straight. Repeat the process using the left leg too. · Repeat it for three to five minutes. · Lie down in Shavasana position (supine position). · Join the both legs and keep your hand close to the thighs. · Slowly breathe in and raise the leg up perpendicular to the ground (keeping knee straight). · Hold in breathe and stay in this position for 30 sec. or more. · Breathe out while bringing back legs. · Relax for a while in normal position. · Repeat the same steps for 3 to 5 times. · First, lie down on your back. · Distance should be approx. 1 feet from your pelvis, along with knees and ankles in a straight line. · Take out your arms beside your body, and your palms should facing to floor. · Now inhaling, slowly lift your lower back, middle back and chest off the floor. · Now gently roll in the shoulders; try to touch the chest to the chin without bringing the chin down, support your weight with your shoulders, arms, and feet. · Keep breathing normally and slowly. · Remember to hold the posture for at least 30 seconds or one minute, and exhale as you gently release the pose. · Lie on your back with your feet together and arms beside. · Take a deep inhalation in and as you exhale, lift your chest and feet off the ground, extending your arms towards your feet. · Your eyes, fingers and toes should be in a mark. · Feel the pressure in your navel area as the abdominal muscles contract. · Keep breathing deeply and easily while upholding the pose. · Hold the position for 30 seconds. · As you breathe out, come back to the ground slowly and relax. · Three to five repetitions daily but should not overdo. Apply either ice and/or a heating pad to the neck for reducing the swelling and pain. Alternate cold and hot fermentation therapy is more effective than using either one. Over-the-counter pain relievers can be used to control the pain associated with Cervical Spondylosis, Do not take for long time, and concern your Physician. Do not be in the same position for a long time – move about and take a break. Do not lift heavy things and keep away from cold drinks and food like rice, refined flour and kidney beans. Keep your posture always correct to avoid further harm to your vertebrae. This is an precious way to treat cervical spondylosis pain and stiffness. Epsom salt baths work miracles in healing as the magnesium present in the salt stabilizes the pH levels in the body. This in turn decreases stiffness, swelling and inflammation. It also decreases pain in your neck and shoulders. All you have to do is take 2 TO 3 tablespoons of Epsom salt and add water for making a paste and apply to your neck and shoulder. Keep it on for approx.15 minutes, wash it and feel the difference. Garlic is a super SPICE for you, says Ayurveda, especially if you have pains and aches because of joint problems and arthritis. That IS because of a good anti-inflammatory agent and an analgesic property of garli. So, eat two to three raw garlic cloves on an empty stomach in the morning with water every day. You can also use garlic oil (oil cooked with garlic cloves) over the affected area, followed by a hot water bath for relief. Turmeric is well known for its anti-inflammatory properties that make it an wonderful remedy for cervical spondylosis. Turmeric also rises the blood circulation. This helps increase movement by reducing muscle stiffness, commonly associated with cervical spondylosis. Add turmeric to milk and drink or consume turmeric tablets. Both worked good. This is one of the greatest herbal remedies for cervical spondylosis that is really effective in handling stiffness and pain caused due to cervical spondylosis. Sesame seeds are rich in calcium, manganese, magnesium, zinc, and copper. They also contain vitamins K and D, which are excellent for your bones and joints. You can also massage neck with warm Sesame oil and follow it up with a warm compress for treating neck pain. Ginger is a best home remedy for cervical spondylosis. It have anti-inflammatory properties. It also helps to increase blood circulation, thereby helping to bring down pain and inflammation associated with the cervical spondylosis. You can incorporate ginger into your daily diet as ginger tea, and also use warm ginger oil to massage your neck area. Apple cider vinegar has good anti-inflammatory properties that make it excellent for treating cervical spondylosis. It also reduces neck inflammation and pain. The way to use apple cider vinegar is by soaking a thin towel in it and placing it over the neck for a couple of hours. Follow this twice daily. Cayenne pepper helps in treating symptoms of cervical spondylosis because it contains capsaicin. Capsaicin in cayenne pepper has potent pain reducing and anti-inflammatory properties. Add a little cayenne pepper powder to olive oil and massage into neck area. Cover the area with a cloth bandage. Leave it on for a few hours (or even overnight) for belter relief. Neem is a strong anti-inflammatory agent and a natural analgesic that reduce neck pain and swelling. Apply thick, hot paste of neem leaves on your neck and feel the difference.